Need Commercial Gardening and Mowing contractors in Holland Park? We offer commercial contract gardening and lawn mowing services in Holland Park, catering to real estate agents and landlords, businesses, schools and universities, hospitals and more. We even offer same day gardening services if our scheduled permits.Just call Commercial Gardening services on 1300 191 565 or you can book a commercial lawn mowing job online for a time that suits or schedule a free, no obligation quote. Gardening and Lawn Mowing prices can vary depending on the size, topography, layout, plantings and overall state of the garden currently, so it is usually best for us to view the garden first to provide an accurate estimate of costs. Ensure your business is professionally maintained & presented by Jim's contract gardening team. We can complete all aspects of gardening maintenance including regular mowing, pruning, edging, fertilising and mulching. We can also address one-off and seasonal gardening projects, such as turfing, irrigation solutions, landscaping, rubbish removal and gutter cleaning. 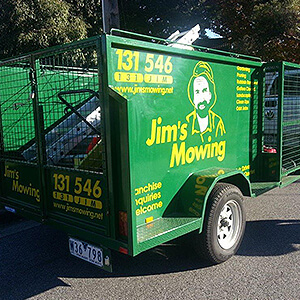 Jim's Commercial Mowing services in Holland Park offer fully trained staff, who can advise you on all aspects of garden care, from plant selection, pruning, fertilization and mulching schedules, watering frequency, pest control, soil pH, plant feed, weeding and wetting agents best suited to each plant, tree and lawn type. It is important that trees, flowers and plants are not damaged when fertilized or mulched.Likewise, watering too frequently can deteriorate soil nutrients and change soil pH levels, reducing the lushness of plants and lawns.Our fully trained gardening team know this, and so much more, so don't leave your business's gardening care to just anyone. Be assured that all Jim's Commercial Mowing staff are required to have a current police check, are fully insured and fully trained. Plus, our work comes with a 100% money back guarantee. Jim's Commercial Customers can be assured that all work is fully OH&S compliant, and work will be carried out to suit their need, including outside of normal business hours, if required. Call Jim's Gardening Commercial Services in Holland Park on 1300 191 565 now or Book a Jim's Contract Gardening Service online, today. What Are the Best Plants for Clay Soils?